For other uses, see Doodle (disambiguation). "Scribble" redirects here. For the song, see Scribble (song). A doodle is a drawing made while a person's attention is otherwise occupied. Doodles are simple drawings that can have concrete representational meaning or may just be composed of random and abstract lines, generally without ever lifting the drawing device from the paper, in which case it is usually called a "scribble". Doodling and scribbling are most often associated with young children and toddlers, because their lack of hand–eye coordination and lower mental development often make it very difficult for any young child to keep their coloring attempts within the line art of the subject. Despite this, it is not uncommon to see such behaviour with adults, in which case it is generally done jovially, out of boredom. Typical examples of doodling are found in school notebooks, often in the margins, drawn by students daydreaming or losing interest during class. Other common examples of doodling are produced during long telephone conversations if a pen and paper are available. Popular kinds of doodles include cartoon versions of teachers or companions in a school, famous TV or comic characters, invented fictional beings, landscapes, geometric shapes, patterns, textures, or phallic scenes. The word doodle first appeared in the early 17th century to mean a fool or simpleton. It may derive from the German Dudeltopf or Dudeldop, meaning simpleton or noodle (literally "nightcap"). It is the origin of the early eighteenth century verb to doodle, meaning "to swindle or to make a fool of". The modern meaning emerged in the 1930s either from this meaning or from the verb "to dawdle", which since the seventeenth century has had the meaning of wasting time or being lazy. In the 1936 film Mr. Deeds Goes to Town, in the final courtroom scene, the main character, addressing the judge, introduces the word 'doodler' – which the judge has not heard before – as "a name we made up back home to describe a person who makes foolish designs on paper when they're thinking." This is clearly not a word in common usage at that time, and the inference is that it is an invented word that no one outside the character's fictional home town of Mandrake Falls would be expected to know. Perhaps the word 'doodle', used here in its modern sense of 'an absent-minded design on paper', was not entirely new and was not actually invented by the scriptwriter, Robert Riskin, but it seems likely that at the very least this film greatly assisted the word into common usage. The meaning "fool, simpleton" is intended in the song title "Yankee Doodle", originally sung by British colonial troops prior to the American Revolutionary War. According to a study published in the scientific journal Applied Cognitive Psychology, doodling can aid a person's memory by expending just enough energy to keep one from daydreaming, which demands a lot of the brain's processing power, as well as from not paying attention. Thus, it acts as a mediator between the spectrum of thinking too much or thinking too little and helps focus on the current situation. The study was done by Professor Jackie Andrade, of the School of Psychology at the University of Plymouth, who reported that doodlers in her experiment recalled 7.5 pieces of information (out of 16 total) on average, 29% more than the average of 5.8 recalled by the control group made of non-doodlers. 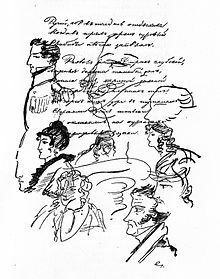 Alexander Pushkin's notebooks are celebrated for their superabundance of marginal doodles, which include sketches of friends' profiles, hands, and feet. These notebooks are regarded as a work of art in their own right. Full editions of Pushkin's doodles have been undertaken on several occasions. Some of Pushkin's doodles were animated by Andrei Khrzhanovsky and Yuriy Norshteyn in the 1987 film My Favorite Time. Other notable literary doodlers have included: Samuel Beckett; the poet and physician John Keats, who doodled in the margins of his medical notes; Sylvia Plath; and the Nobel laureate (in literature, 1913) poet Rabindranath Tagore, who made numerous doodles in his manuscript. Mathematician Stanislaw Ulam developed the Ulam spiral for visualization of prime numbers while doodling during a boring presentation at a mathematics conference. Many American Presidents, including Thomas Jefferson, Ronald Reagan, and Bill Clinton, have been known to doodle during meetings. Some doodles and drawings can be found in notebooks of Leonardo da Vinci. ^ "Doodle (verb)". Etymonline. Retrieved 11 March 2017. ^ "Doodle". Dictionary.com. Retrieved 11 March 2017. ^ Riskin, Robert (1997). Six Screenplays. University of California Press. p. 456. ISBN 978-0-520-20525-3. Retrieved 11 March 2017. ^ "Pushkin Drawings". feb-web.ru (in Russian). Archived from the original on 2014-09-08. ^ Sandler, Stephanie (2004). Commemorating Pushkin: Russia's Myth of a National Poet. Stanford University Press. p. 156. ISBN 978-0-8047-3448-6. Retrieved 11 March 2017. ^ Bethea, David M. (19 December 2013). The Pushkin Handbook. University of Wisconsin Pres. pp. 412–414. ISBN 978-0-299-19563-2. Retrieved 11 March 2017. ^ a b Temple, Emily (January 30, 2011). "Idle Doodles by Famous Authors". Flavorwire. Retrieved 11 March 2017. ^ Gardner 1964, p. 122. ^ "All the Presidents' Doodles". The Atlantic. Retrieved 2012-05-02. Look up doodle or scribble in Wiktionary, the free dictionary. Wikimedia Commons has media related to Doodles. Brown, Sunni. "Doodlers, unite!". ted.com. Retrieved September 23, 2011. "Doodling As A Creative Process". Enchantedmind.com. Retrieved June 10, 2011. Gombrich, E. H. (1999). "Pleasures of Boredom: Four Centuries of Doodles". The Uses of Images. London: Phaidon. pp. 212–225. Hanusiak, Xenia (October 6, 2009). "The lost art of doodling". Smh.com.au. Retrieved June 10, 2011. Malchiodi, Cathy (January 13, 2014). "Doodling Your Way to a More Mindful Life". Psychology Today. Retrieved March 15, 2015. Spiegel, Alix (March 12, 2009). "Bored? Try Doodling To Keep The Brain On Task". NPR.org. Retrieved June 10, 2011.